What to get enough of, what to avoid, how much to consume, what to look for. The majority of people are unsure how to read a nutrition label which ultimately means they are unsure of what their nutrition consists of. 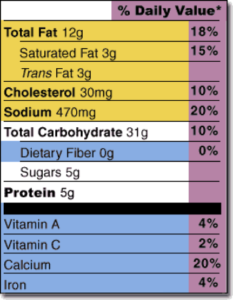 Here is a simple, quick, and easy breakdown of how to navigate through a nutrition label. Ideally, you are consuming foods that don’t have a nutrition label because they are organic or naturally sourced foods. E.g. tomato, spinach, banana, potato etc. Eat naturally and you won’t have to worry about reading a label. At the top of the nutrition label it will state the serving size and servings per container. This is an important step because if you consume an entire box of something that contains 3 servings, the calories and all the nutrients need to be tripled. The word “calorie” comes with some a negative stigma. “Cut your calories,” “there are so many calories in that,” “too many calories will make you fat.” Instead think of calories as energy because that is exactly what they are. They provide your body the energy it needs to survive, workout, and perform daily tasks. It’s not just about the calories, but what types of calories i.e. energy you are consuming. Under the serving size will be the calories and calories from fat per serving. Remember, this is ONE serving. Sticking with the above example, if you ate the entire box which had 3 servings, you would be consuming 300 calories and 150 calories from fat. As a general rule of them, 40 calories is low, 100 calories is moderate, and 400+ calories is high. Ideally, keep these numbers as low as possible. Step 4: Eat MORE of these. The following nutrients are the ones we should strive to increase and eat enough of. Yet again, unfortunately this is where the majority of people lack. Examples of food that contain these nutrients: Fruit, veggies, and grains. Step 5: Footnote?! Aren’t those in books? 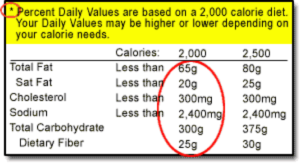 It is important to note that the percent daily values (DVs) are based on a 2,000 or 2,500 calorie nutritional intake. The numbers circled are recommended DVs. They are meant to be general recommendations, not individualized. -Looking at the chart above, you will see that total fat, saturated fat, cholesterol, and sodium have upper limits and are recommended to eat less than the designated DV. In the example above, the daily value for total fat is 65g. 65g equals 100% of the daily value. Your goal would be to eat less than the %DV which is 65g. -The lower limit is the exact opposite. They are recommendations that you eat at least the %DV recommended. Step 6: How to follow % Daily Value (DV). Not great at math, no worries! The food labels do the math for you. When looking at the food label, you will see the %DV listed to the far right side. 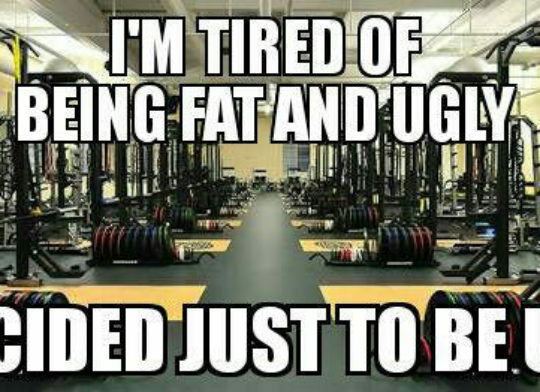 Take fat for example. The total fat is 18% of your %DV for 1 serving of this particular food. 18% is almost to 20%, so it is a food that is high in DV and we want to, in this case, eat less of. 1 serving: 100% – 18% = 82% fat left to consume for the rest of the day. 2 servings: 100% – 36% = 64% fat left to consume for the rest of the day. Once you understand what the values mean, it is easy to compare products to determine which product or food is better for you. Aim for your fiber, calcium, vitamins, etc to have a high %DV and your fats, cholesterol, sodium, to have low %DV. The %DV for calcium is also based on a 2,000 calories diet which is considered to be 1,000mg or 100%DV. In the product above, it contains 20% of your DV. This product would be considered high in calcium because it is 20% or greater. Depending upon the individual, you may need to increase the amount of calcium you consume to over 100%. Example, individuals with osteoporosis, children, menopausal women, etc. Step 7: What about nutrients without a %DV? Trans fat, sugar, and protein do not have a recommended %DV. So what do we look for? Trans fat: Keep as low as possible. Protein: %DV do not need to be on the label unless the product claims to be a “high protein” food. A general rule of thumb is to consume 0.8g – 1.0g of protein per pound body weight. Sugar: There is also no daily recommended value for sugar, but it is another one to keep an eye on and remain low. It is important to note that there are forms of sugar that are naturally occurring versus artificially or added sugars. Take a look at the ingredient list to determine what types of sugars are in the product. The ingredient list has items listed in order of weight, from most to least. Other names for sugar: corn syrup, high-fructose corn syrup, fruit juice concentrate, maltose, dextrose, sucrose, honey, and maple syrup. Next time you grab a product to check out the nutrition label, don’t be afraid! Follow these steps and start to make smart decisions on what you consume. I have news for a whole lot of people.... This news is something that no one wants to admit but Read more! [caption id="attachment_533" align="alignright" width="250"]Read more!